I think I've found the formula for the one-hour serial drama, or at least the ones I can't live without: The leading man as anti-hero. Yes there are layers and complexity and some goodness, but each lives by his own moral compass and will do whatever it takes to preserve the life they've created. 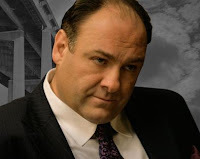 Tony Soprano was the original iconic character of this type. He was the mob boss with a conscience - or at least a sense of one, that was driving him into panic attacks and depression. He preyed on weaker sorts and stepped on anyone that got in his way, but you could always feel the underlying sense of responsibility. And so could the multitudes that made HBO the new Must-See-TV. 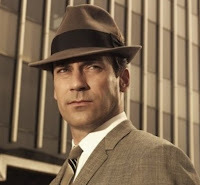 Mad Men's Don Draper certainly seems like an idealist. But he lives off the the identity of a slain military mate. He is a professional scoundrel and serial philanderer. Yet he has million-dollar ideas scrawled out on cocktail napkins and an air of invulnerability, so he is respected by all. 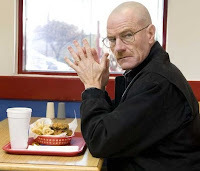 In Breaking Bad, Walter White isn't cut from the same cloth. He was the stooge, a victim of unfulfilled promise on the road to nowhere and had a date with terminal cancer. So the chemistry teacher made his own destiny, creating the purest grade of crystal meth on the market. The series doesn't dwell on the effect of the drugs in the community (which is bad enough), but it does graphically show the death and destruction left in Walt's wake. Yet we still root for him. Which leads me to Big Love and Bill Henrickson, the self-righteous husband of three and father of eight. Bill may have finally turned down a darker path with his foray into politics, and a campaign for State Senator. Bill's ability to talk to people and tell them how things have to be is what's most admirable about him. He has Heavenly Father on his side, or at least he's 100% certain that he does. He is straight and true no matter how many dumpster-fires are popping up all over his rather large family. "This will be resolved." has become Bill's mantra. First Wife Barb is stepping all over toes at the family-owned, tribal-run Casino. Second Wife Nikki has always been the train wreck. Now she looks to be straightening out the ship for herself and her estranged teenage daughter, but her polygamist compound ties are pulling her back. Third Wife Margene is the mid-20s hottie whose career is taking off as a QVC-style jewelry hawk. 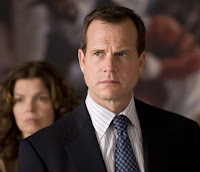 As one of three wives, she's not getting the attention from Bill, and has turned a longing eye at Bill's 18-year old son Ben. Daughter Sarah took in a meth-head and her son. The Mom took off, and Sarah's been playing Mommy to the baby without alerting authorities. Brother Joey killed Roman Grant "The Prophet of Juniper Creek," then burned the body. Now he's being blackmailed by Nikki's ex-husband, who has his sights set on being the next prophet. And forget about Bill's nutjob parents. 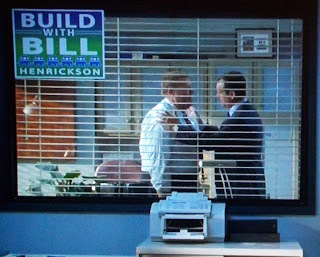 But maybe the most heart-breaking move Bill had to make was in his cutthroat political race. He fed Don Embry to the wolves, making him fall guy for a polygamist scandal in Home Plus, Bill's home improvement franchise. Don was Bill's managing partner and spiritual confidant, and Bill made him "take the bullet" so he could maintain his political campaign. 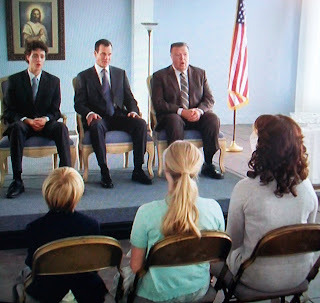 Now Bill has cast out (in some form) both his son and his closest ally, the two men he entrusted to be Priesthood Holders in the newly-minted Church Of Bill, or whatever it's called. So while Bill's lifestyle choices and manipulation skills have always been present in what is now the 4th season of Big Love, now he has to make the hard choices and turn his back on the people he's closest with. All in the name of Bill Enterprise. Bill has flipped, over-reaching with his time, businesses and ambition, and his pride is bringing out qualities we don't like quite as much. But the show has turned the corner too. Big Love was once quirky and unconventional, almost a comedy. Now the problems are serious and the mood is much darker, and Bill mirrors that.